Alliance finally gets a mount that's not a horse in patch 8.1.5 -- because the Horde stole it! Battle for Azeroth is an expansion with two completely different stories to tell, depending on which faction you choose to play. Sure, the stories intertwine at some points, but if you’re leveling Alliance, the quests you complete are quests that the Horde simply doesn’t experience — and vice versa. It’s a duality that’s reflected throughout the game, right down to the items offered in the Collector’s Edition — a double-sided coin, a double-sided novel. You can choose to get behind and play one faction, or you can choose to play both. If you happen to play both, you can rest easy in the fact that you won’t be repeating quests on the alt of your choosing — there’s an entirely different tale waiting for you on the other side. There’s also an entirely different mount, apparently. 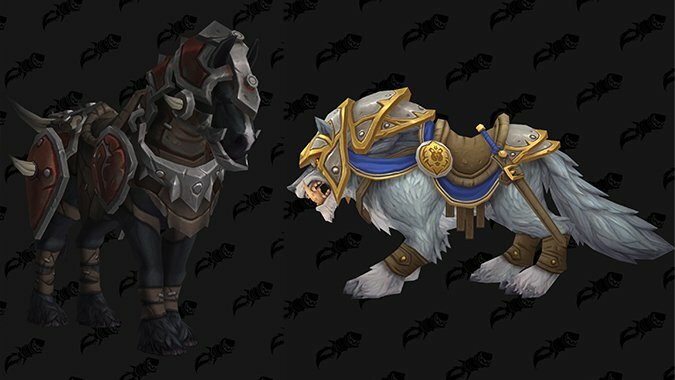 Wowhead found two new mounts in the latest build of the 8.1.5 PTR, the Bloodflank Charger for the Horde, and the Ironclad Frostclaw for the Alliance. While both factions have been able to ride horses and wolves for a while now, these guys are a little unique in their appearance. The Horde horse is decked out in a full set of Horde plate, and the Alliance wolf has a full set of Alliance armor. Each mount includes flavor text telling you where they came from. The horse was stolen from Arathi Basin, and the wolf was snatched from the snows of Alterac Valley. But don’t let the locations fool you — you won’t need to PVP to earn these. Instead, you’ll need to complete the achievement Two Sides to Every Tale. If you have an alt on the opposing faction, chances are you’ve already completed this — if you don’t, it’s fairly straightforward. Level a character on the opposing faction, play through both stories, and complete the Tides of Vengeance achievement as well. Alliance characters will need to clear A Nation United, which includes Loremaster of Kul Tiras and The Pride of Kul Tiras quests, and Horde characters will need to similarly clear Zandalar Forever!, which includes all story chains in Nazmir, Vol’dun, and Zuldazar, as well as the Blood Gate quests and Final Seal scenario. As for the Tides of Vengeance achievement, if you’ve finished unlocking the requirements for Zandalari or Kul Tiran Allied Races, you’ve completed Tides of Vengeance. It’s just the end of the current War Campaign. This is the first time we’ve seen a tangible reward offered for leveling up characters on both factions. But if any expansion warrants the effort, it’s Battle for Azeroth. We’ve seen the Alliance and Horde level with split stories before, but we’ve never had them level on completely different continents, and the stories have never been this different. It was already worth it to experience them both as a lore fan — adding a couple mounts as an extra incentive is just icing on the cake. If you’ve already experienced the story on both sides, you may just log in to a couple of new mounts automatically when patch 8.1.5 hits live servers. But if you’ve been avoiding the other faction’s stories, perhaps a free mount or two will help convince you to check them out? Regardless, Blizzard’s storytellers have managed to craft two really unique leveling experiences this expansion — it’s worth the additional playthrough, mount or no.